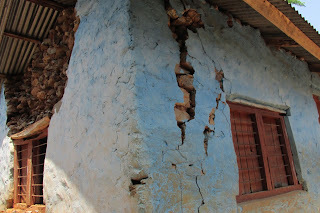 Although Lamjung District has not been nearly so badly hit by the earthquakes as other districts, the damage to homes and schools is still quite severe in some areas. The continuous aftershocks, there have been more than 200, have compounded the initial damage caused by the big quakes on 25th April and 12th May. 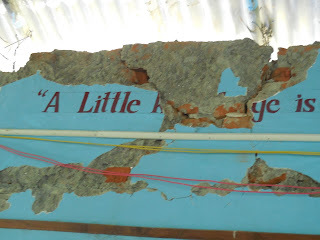 Fallen wall and cracks in corner of classroom. Many schools have large cracks and structural damage, rendering them unsafe for lessons to be held in their classrooms. Others have damaged toilets which need replacing or repairing. Understandably parents are concerned to send their children back to school, to sit in rooms that may collapse with another shake. 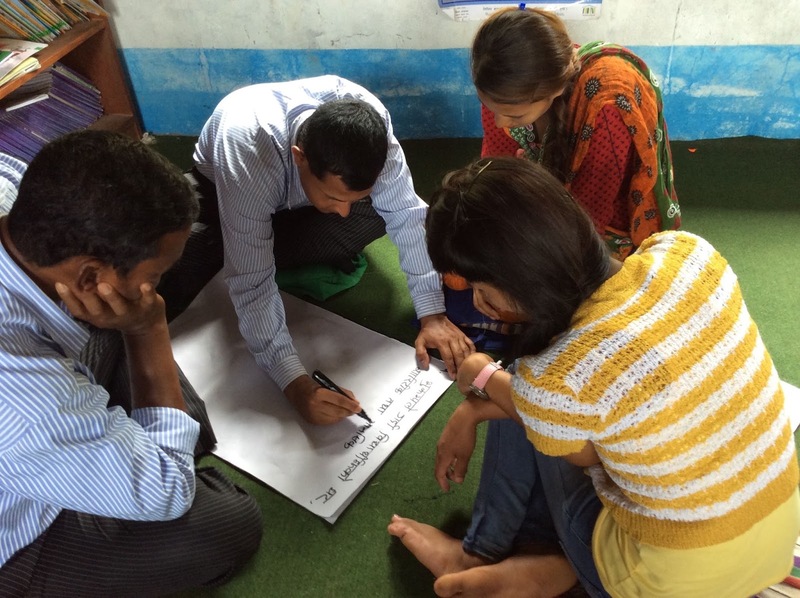 In order to allow pupils to return to lessons VSO Nepal have been hard at work developing a plan to help. Cracks in another classroom wall. VSO Nepal's 'Emergency Education Initiative' has obtained funding and permission to work, initially with the worst damaged schools in Lamjung District, and then to move onto two other Districts, as people are ready to think about schools again once they have personal living accommodation. Having surveyed all the schools reporting damage in 8 VDCs ( similar to Parish Councils in UK), those unable to continue with lessons have been selected to receive temporary Learning Spaces (TLS, Temporary Classrooms). These will be erected nearby or on school premises as soon as possible, using local labour and materials as much as possible. Bamboo frames will be covered with corrugated iron sheets for roofing and walls will be constructed of iron sheets too, or bamboo, tarpaulins, wood or woven straw. All metal will get hot in the sun, so some insulation covering for the roof will also be required. Contents of the Early Years resource bag. UNICEF have donated equipment to be distributed to the schools too. Bags of lovely puppets, books and games are for the youngest children in school, the ECD classes. How excited the children will be when they see these! Recreational kits; balls and sports equipment have also been provided for each school. We plan that these will be used by the Youth Volunteers to provide extra curricular activities in each of the villages. Classroom equipment - School-in-a-box - also from UNICEF will ensure that everyday resources are available for each class, so that lessons can continue as usual. These boxes contain exercise books, pens, pencils, rulers and coloured crayons along with lots of other essential things for the classroom. by tractor and trailer for delivery to schools. All this equipment has to be transported by tractor and trailer to the schools, many in very remote hilly places. the temporary classroom, with bags of educational resources. "Put my fingers in the paint?!" The Youth Volunteers, five for each VDC, have been employed to assist with recovery and ongoing activities for the students. We held a training day for them, where they were taught to recognise and help children and young people affected emotionally by the earthquakes (psychosocial effects). There was also lots of fun and laughter as they experienced art and music therapy and learnt easy games to play with students. Finger painting, which they had never done before was a particular challenge, as they were unwilling to get their fingers covered in paint! Team games - not something these Youth Volunteers had experienced before. Finally, teachers are being given training so that they understand and are able to help students who are suffering emotional effects as the result of the earthquakes. When completed, around 400 teachers will have been trained in the 8 VDCs (Village communities). This training has included using art and music to help students, as well as games to allow them to have fun. Teachers role-play living in a shelter.